In these recent days of anguish, when hundreds of students are taken into custody and at the very least psychologically abused, when Human Rights Watch issues a damming report that should send Maduro to jail some day, that inside the opposition there are clearly double agents that try to protect regime's human rights violators in the US in exchange of, well, goodies, etc. it is a good time to remind the reader what is ABSOLUTELY at stake here, least we get confused by all of these people trying to confuse the truth out of reality. Fortunately I have an OpEd of Maria Corina Machado in El Universal today which is a short summary of what is at stake and I am taking the now rare step of translating it. Least anyone still has doubts, least anyone thinks I am an extremist. These days I heard a fellow UNIDAD [opposition MUD] say that the goal of the protests should be solving problems and not trade Maduro. If we lived in a democracy, it would be a startling statement; the logical aim of an opposition is to reach power constitutionally asap. But Venezuela is a dictatorship. It is a regime that to remain in power and to dominate society needs society ruined, divided, terrorized and dependent on the state. A regime that does not want to solve the problems. The institutional, economic and moral destruction that we suffer is not only due to the infinite incompetence and corruption of the regime, there are part of a deliberate plan: to finish off everything that allows society to live independently, to demand [its rights], to defend itself. Thus the relentless attack against [trade] unions , universities, the media, businesses, professional associations, neighborhood associations, political parties, NGOs and even churches . Is our goal is to increase the allotted preferential dollars or have an economy without controls ? [Is our goal] that they allow to import a little bit more newsprint or that there is full freedom of expression and the return the concessions wrested from [free] TV and radio? [Is our goal] to raise a little bit salaries or is it that public and private companies be competitive and pay worthy wages growing up apace with productivity? 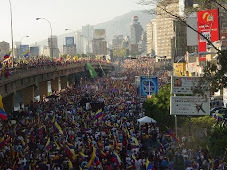 Who can believe that the regime led by Maduro will stop judicial decisions made ​​in Miraflores [Palace]? [Who can believe that the regime] shall respect the right to property and end expropriations? [Who can believe that the regime] will disarm paramilitary groups ? That it will expel the Cubans from the army? That it will stop the gifts to foreign clients? That public employees will cease to be political prisoners? That citizens can protest peacefully without being repressed ? This is why Venezuelans have understood that it is not a matter of asking the regime to change its policies; it will not. Our struggle is for regime change by constitutional means, as soon as possible; and it is therefore essential to maintain peacefully public pressure in the streets. A fellow Barquisimeto impeccably expressed it these days " it is not about improving the conditions of captivity , it is about living in freedom." Of course, regular readers know that these ideas , all of them and more, have been exposed this year alone at least once in this blog. But it is nice to have a reminder. And to also be reminded that those that have a clear mind, a clear message, are, well, sidestepped by the MUD who is only too happy to let the regime deal with its mess as long as they get a token of gratitude, preferably in cash, from the regime. You know who you cowardly are, but it is not Maria Corina Machado, it is not Lopez, it is not the students. I love Maria Corina Machado for her clarity of expression and purpose. However, I suspect that it is that very same clarity that grates on many Venezuelans who do not want to deal in absolutes. Now that the facts are a bit clearer than before, those who a different viewpoint for so long will come crawling out of the wood works with changed opinions as though they knew it all a long. he he ( and I am not referring to you Daniel) ...Cowards, sycophants, and grovelers,and they know who they are.I waste no time with them.I also know they will always be the first to call anyone radical who has seen a bit further down the road.Long vision is a rare quality and it irritates many people. We cannot let insults stop us from feeling free to speak our minds.Calling somebody a radical is just an insult without substance and living proof that they have no argument. Good luck with a legal regime change. Now we touch on the subject of the importance of intention. Roy, Many ( not all of course) Venezuelans, (and there are many in the US as well )who do not believe in absolutes, find it is much more convenient to believe in a certain type of nuance or flexibility when they themselves do not want to be held accountable even to themselves.That is one kind.Others, have the idea that it is against Christian and/or HIGHER levels of thinking to come out and condemn others in no uncertain terms( in order words they are the bearers of false pride).These are the folks that feel exquisitely good about themselves when they can say : " I won't lower myself their levels "
The funny part of that is, they actually do lower themselves through lies, but only to APPEAR to be on a higher level.This image manipulation is what Politics is all about. This letter is in response to the articles covering the civil unrest occurring in Venezuela. As a citizen of and believer in democracy, I applaud the efforts of the Venezuelan people. Their efforts are similar to what is happening in many other parts of the world. Believe it or not, one thing that trumps capitalism and political correctness in the United States is the right to have one's voice heard. This is the foundation of which our democracy is built on. The Venezuelan people should continue to defy Niccolas Maduro's powerful security forces so that Venezuelan democracy can begin to thrive. It is unfortunate that the United States compromised on one of its most fundamental values in order to protect its economic interests in South America; something that happens all too often domestically as well. It is not the Venezuelan people that are attempting to seize power but rather it is those currently in power who have engaged in intimidation to prevent the will of the people from being heard. Why else would they stoop to such underhanded tactics to block various means of communication among the citizens of Venezuela? Why is the government in power utilizing such political strong-arm tactics as the use of violence? Nicolas Maduro, you have had almost one year to lead Venezuela and have failed them by your own choosing. The days of the despotic regime are finally coming to an end as it appears the desire for freedom will continue to sweep among the South American nations. Accordingly, let the call go forth among all citizens of Venezuela that your brothers and sisters of democracy from all over the world are with you during every trial and tribulation you may encounter during this crisis. To the people of Venezuela, the trumpet of freedom beckons you to rise in protest and ensure your voice to preserve your sacred heritage, promote your children's future and obtain the blessings of liberty we all cherish. Venezuela, the hour of your redemption is at hand. As you the rightful citizens move forward to reclaim your own country, rise and strike! In the name of those who were murdered fighting for everyone's rights, rise and strike! To end the rule of this evil regime, rise and strike! Let no one continue to fear this man. Let every Venezuelan be strong and fight on for their freedom. Rise and strike! Nicolas Maduro, let the people go! An indispensable beacon of liberty, unfortunately too much of a patrician for the vulgum pecus. Yes, part of their ideological program is destroying the culture, the wisdom, and the people of Venezuela in order to supposedly breed a new Socialist breed of human from among the wreckage. Their ilk have been attempting to do this with wheat and humans since 1917, with no evidence of results, and no scientific basis to ground their claim to justify the impetus to carnage. The disastrous Soviet plant husbandry program was based on such Socialist pseudo-science, lest we forget the maleficient TD Lysenko, and the humanitarian disasters his delusional junk-science caused amongst the Russian people. Yes, as the Old Testament of the Hebrews would call it, the Chavistas, being devout Leninists, wish to transform Venezuela into a "TOPHET." They will sacrifice the lives and futures of 100% of the youth to attempt to continue their programme of ego-protection, denial of failure, and genocide. When the true inmates run the asylum, all the goals are insane, evil.